Ok, so you have a blog. You’ve read a couple of posts and free e-books and they all tell you that “Content is King”. So that’s what you did: you produce content. You began writing diligently. It didn’t matter if it is Christmas or it’s your spouse’s birthday, you always find time to write and “tweak” your blog. The only problem is you were hoping that by now, at least someone is noticing what you’re doing. Except that nobody did. Then you read about how millions of blogs are created daily, and that 99.9999% of all blogs fail to see the light of day before they descend into the oblivion. And next thing you know, you didn’t feel like writing and you gave up altogether. Not all content are made the same. Some content are read while others are simply ignored. Content that are read can increase your authority or it can help piss your readers off. The difference between the two is a factor I like to call “remarkability”. Has an intended reader. Who are you writing to? Can you picture him/her in your mind? Is it a single mom with a toddler? Is it a Mac geek? If the article you’re writing applies to everyone and anyone, ditch it. It will never be a remarkable content. Goes into the specifics. Top 10 lists are almost never remarkable. If you want to write remarkable content, write about something very specific (clause 5 of the credit law and how it affects you) as opposed to something general (how to eliminate debt). Is engaging. It must be interesting to read, like a novel you can’t put down. Contrary to popular belief, people DO read plenty of words online… just look at how much words are on New York Time’s and other authoritative websites. The difference between a content that is ignored and one that is read is in whether or not that content is engaging or not. Is unique. And by unique, I don’t mean “passing copyscape”. By unique, I mean is the subject you’re writing about “Googlable”? Do your research and write about a new topic that your intended readers are not usually aware. A blog that stands out need more than just remarkable content, however. It also needs remarkable design. By “remarkable design”, I don’t mean flashy graphics and cool animation. I mean usability. 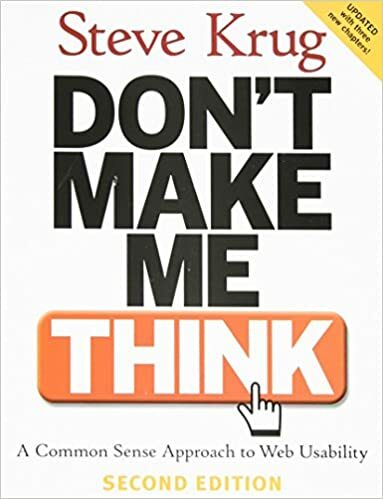 Steve Krug, in his book “Don’t Make Me Think”, wrote that his title is the cardinal rule of web usability. In other words, all websites have to be easy to use and fast to load. The problem is making websites that are easy to use is what I like to call “the curse of knowledge”. What is the curse of knowledge? Well, have you ever tapped a table to the tune of a music you’re playing in your mind only to have you friend asks you what you’re tapping? And you thought, how could he/she not know? It’s so obvious! That is the curse of knowledge: it’s hard to imagine NOT knowing what you already know. The curse of knowledge is why experts like to use jargons (what’s an RSS feed?) and why they build complex websites (it’s only three clicks deep, how can they not find it?). So here’s what I want you to do: go through your website and ask yourself if the word you use is the convention, or not. For example, the convention is “about me” or “about us”, but some people used “profile”. It’s not much of a difference but it does make the user think (even if it is only 3ms of it). But no, build it and they will come, just won’t happen. Waiting to be discovered is the worst thing you can do because you’re simply leaving your blog’s fate to chance. You might as well gamble in Vegas… I hear it’s a lot more fun. A lot of people spam to promote their blog. They leave comments like “awesome post” in thousands of other blogs– which technically is not spam, but I view it as one. They go to directories, spin articles, and do all those crap. A remarkable promotion, however, is one where your advertisement itself is valuable (a tip I learned from Gary Bencivenga). Not to toot my own horn, but this very post is an example of a remarkable promotion. I gain exposure from this article, you (the readers) get value out of it, and Kim gets free content. All parties win! Last but not least, you need to track your progress and adjust your strategy. Take a different approach to your content, or adjust your header and see if your bounce rate improves. Run an ad to promote your blog, or do a guest post like this one and see which one works better. A blog that stands out is the result of years of trialling and failing. And there’s no choice: you can’t just copy off your neighbour and expects the same results.